Can an evangelical theologian and his gay son overcome the differences in belief that threaten to destroy their relationship? For Brad and Drew Harper, that question wasn’t theoretical—and neither was the resounding “yes” they found after years of struggle. Writing to each other with compassion, grit, and humor, Brad and Drew take us on their journey as parent and child —from the churches of Middle America to the penthouses of New York’s party scenes, from a pastor’s-kid childhood and painful conversion therapy to the hard-won victories of their adult relationship. But Space at the Table is more than just a memoir. It is a guide, showing us a way through the roadblocks that threaten to devastate both families and the broader evangelical and LBGTQ communities. 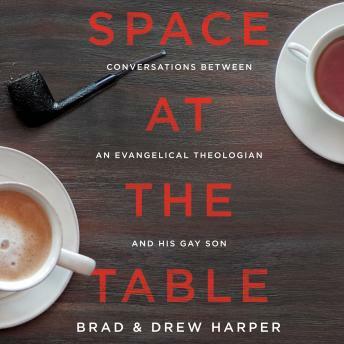 Speaking from their own experience, Brad and Drew offer an invitation to join them in a place where love is stronger than the beliefs that divide us.